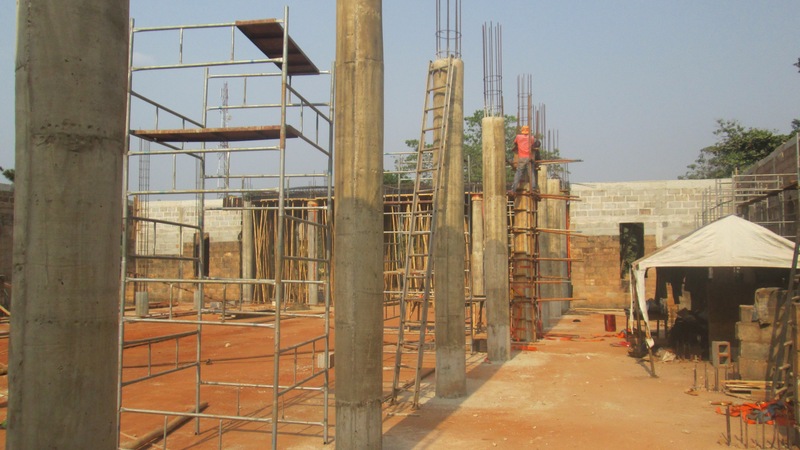 This page is created to give you a quick look at the formation of the pillars for the new church. First, the cement floor was broken up in 5ft squares by jackhammers connected to a generator. Then, holes were dug straight down about 8ft deep to form the base of the pillar. The base is of concrete and rebar, 4ft by 4ft by 2ft. Out of that comes the 18 inch in diameter columns. The wood form is a thin sheet of plywood inside of 1 by 1;s formed in a circle cut into 3/4 inch plywood. The two halves were then clamped together throughout the form so that the weight of the cement would not break through. The pillars were formed in two parts, the first to about 4ft about the floor, the second to its height of 16ft above the floor. They are 24ft pillars from the base to the top of the pillar. Two of the exterior pillars in the front are 3ft in diameter and will extend 50ft above the floor level, which will be the level of the ceiling.